Inventory We are a resale marketplace, not a box office or venue. Ticket prices may exceed face value. This site is not owned by KFC Yum Center . The KFC Yum! Center is a US $238 million, 22,000-seat basketball and multipurpose arena that opened on October 10, 2010 on the Ohio River waterfront in Louisville, Kentucky USA on Main Street between Second and Third. The project is part of a $450 million project that includes a 975-car parking structure and flood wall a hotel was proposed but later deleted from the project. On April 19, 2010, it was announced that Yum! Brands would pay US $13.5 million for the naming rights and will sell the products of three of its chains KFC, Pizza Hut, and Taco Bell in seven concession stands within the arena. 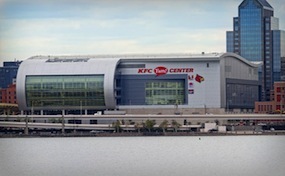 The University of Louisville men's and women's basketball teams are the primary tenants of the arena complex; however, conventions, ice shows, and collegiate sport championships also use the facility. Yum.CenterLouisville.com is not affiliated with any primary box office or supplier. We are a privately owned and operated business specializing in sales in the secondary market. To buy tickets for any KFC Yum Center events in Louisville simply click on the event of interest or call our operators at anytime.